One Biosecurity is a new state-wide approach to managing, protecting, and promoting South Australia's strong biosecurity regime across its livestock industry. 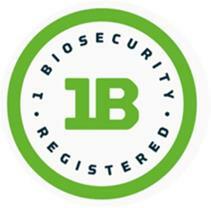 Primary Industries and Regions SA (PIRSA), through Biosecurity SA, has developed the program in collaboration with the livestock industry, in particular with the assistance and support of Livestock SA. As part of One Biosecurity, livestock producers can register, manage and declare their farm biosecurity online. This one-stop, online animal biosecurity management tool will provide best practice biosecurity assessment, management, advice and guidelines for multiple livestock diseases in South Australia. Click here to learn more about the One Biosecurity program. Producers seeking support or any questions regarding their One Biosecurity registration – including how to undertake a risk assessment of their property – can find more information in the FAQ section, email 1BSupport@sa.gov.au or call (08) 8429 3300 during business hours. Producers are reminded to immediately contact the Emergency Animal Disease Watch Hotline on 1800 675 888, a Biosecurity SA staff member, or their private veterinarian if they suspect any form of exotic or notifiable disease in their animals.